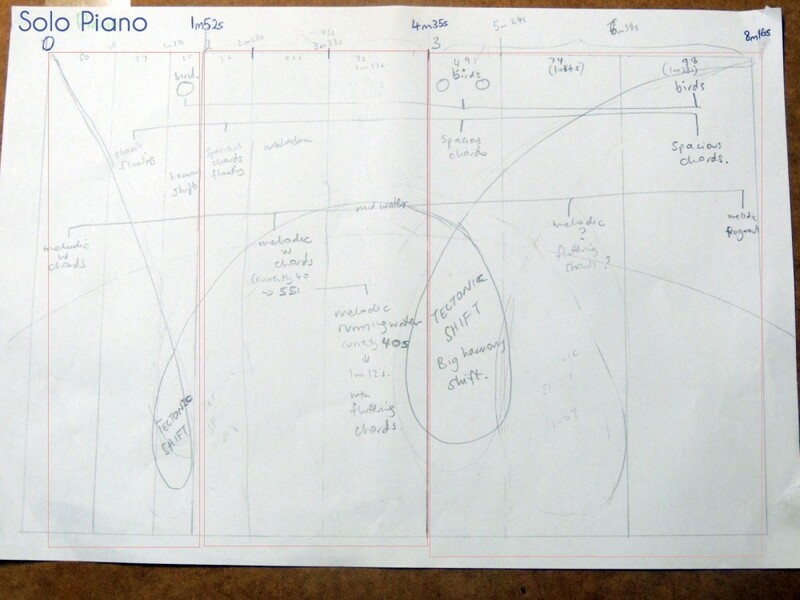 I’ve just finished writing a new piece for pianist Alex Raineri. It’s called Nature Spirit and I wrote it after spending a lot of time in Currumbin Valley in South East Queensland. 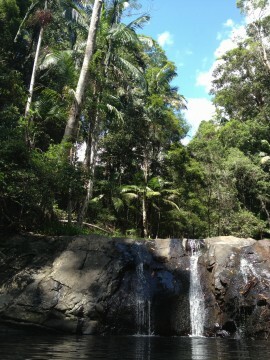 There’s a secluded rainforest walk at the end of Currumbin Valley. Approaching it, you pass a picturesque, craggy escarpment. Currumbin creek starts there as a trickle, then turns into rapids and widens into a stream that eventually meets the ocean. This place is special to me. When I spend time here, I feel like my brain clears. I’m relaxed yet alert. Creative ideas seem to just flow. It was an easy to decision to write music inspired by the natural beauty of this area and how I feel when I am there. This includes: the awe I feel when looking up at the escarpment and knowing this ridge is part of a 45,000-year-old volcanic region. The play of light on water as it reflects the trees and sky above and how strange this same view looks from creek level with the trees looming above like skyscrapers! The thought of what it might be like to follow a raindrops journey from the leaf on a rainforest tree, into the creek and all the way down to the ocean. The impromptu Butcher Bird concert I experienced one day at the base of the escarpment, how it distracted me from fears and worries about my canary who was having surgery at the time and how it reminded me that all life (human, animal, plant) is part of one big continuum. How I visited the rock pools as a child (holidaying from the UK) and how alive I felt being here, and how I still feel that way today, almost 30 years on. The Yugambeh people are the traditional owners of Currumbin Valley and are its custodians. I pay my respect to their elders past and present. They believe this land was created by a powerful ancestral figure connected to water – who fed the rainforest, eroded mountains to form the valley and surrounding land. This idea also impacted my music. It piece begins with deep earth (low notes) that ascend floats up into the heavens. I had the image in my mind of the escarpment. The music is contemplative, slow-moving and expansive. Many of the overlapping phrases have a 1: 1.5: 2 ratio at the core, but the durations (or actual time values) are different for different phrases. Each is shortened or lengthen with next iteration, creating a subtle contraction and expansion. Rippling Major 2nd figures that hint at the more flowing water music to come. At times, the layers of different slow-moving rhythms, coalesce into a slow-moving chorale. In the second section, the rippling major 2nd figures from the beginning become a kind of mercurial water music that is constantly changing character: flowing, pausing and changing course, pattering like raindrops, or pushing forward as in a sudden surge of current. Long pauses that appear at the ends of phrases echo back to the chorale earlier. The last section returns to slow-moving chorale but this time with an ascending ground bass melody that moves up into the ether. This section is simple and full of sweetness. Contemplating nature often gives me a feeling of deep relaxation and peace. This music aims to evoke this state. When we take the time to simply be in a place, to observe, to commune with the birds and trees, water and rocks, we connect to something much larger than ourselves. My composer friend Chih-Chen Wei (Taiwan/USA) shares this view. Her music draws on her Chinese heritage and the practices of Chinese landscape painters who aim to channel the energy, mood or a spirit of a place into their art. Her gorgeous piano piece Between Stream and Hills is one creative exploration of this idea. On June 10, Alex Raineri will premiere Nature Spirit at Gretel Farm in Bangalow (see details below). If weather permits, the performance will be outside in the garden. I hope this is the case as I have written a birdcall into this piece and I am hoping the actual bird, a brown goshawk, might perform too! 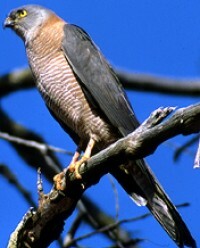 When I visited Gretel Farm back in February, I heard a distinctive birdcall, a juvenile brown goshawk calling to its parent. The call is a kweek kweek repeated pattern that increased in speed and urgency as the parent approaches with food. Being somewhat passionate about food myself, I found this quite amusing. You can hear my musical reimagining of this call below. I say reimagining because the birdcall is transformed. What’s more the piano bird is a turning point in the piece. You can see this in my plan for the piece. The big loops coincide with the birdsong moments. There is a shift in harmony but also a sense of time standing still or the eternal in the present moment. These moments herald a change in musical materials (though not necessarily immediately). I got this loop/transformation idea came from visual artist William Robinson, who spent many years painting Canungra and Springbrook landscapes (also in South East Queensland). One of William Robinson’s preliminary sketches for his Creation Landscape series is a simple line drawing of a curved panorama with two spiraling, descending loops. The loops are part of how he plans how to manipulates light and perspective. One of the things I admire about William Robinson’s painting is his ‘simultaneous perspective‘ where the viewer views the landscape from many different vantages points at once. I’ve always thought there is something very musical about this, kind of like the heterophony of Cambodian and Thai court music. I used this image of loops while I was composing to help to hold in my mind the sense in which everything in my piece (the birds, the escarpment, the water) should be connected whilst also transforming and changing. I recently found out that William Robinson likes to play Bach on piano. And, what’s more, Alex Raineri bought William Robinson’s piano and now practises on it at home. So Alex has playing a piece that’s partly inspired by Robinson’s painting on a piano that Robinson himself once played. And well, Robinson probably played this piano because his art is partly inspired by music. How funny to realise that these interconnections go much, much further than I thought. 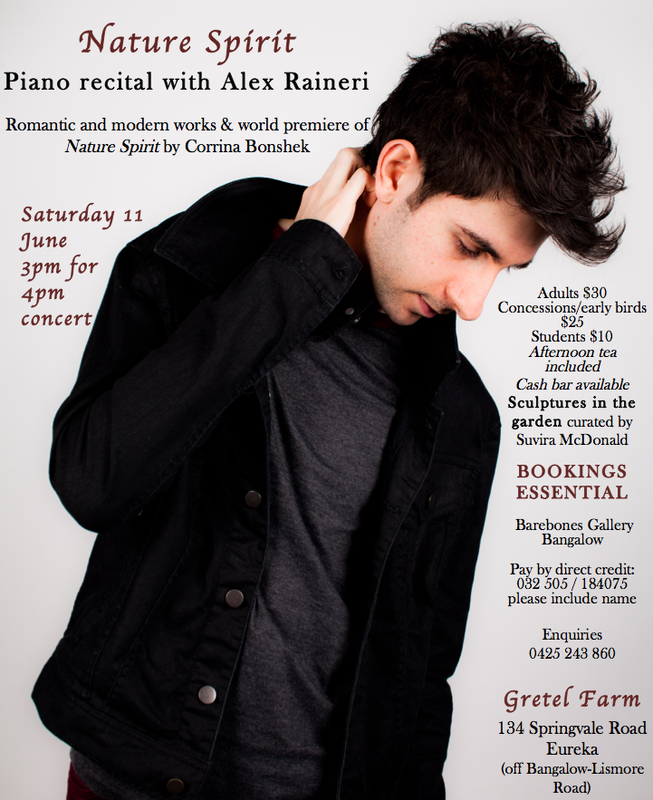 Hear Alex Raineri perform Nature Spirit on June 11 at Gretel Farm in Bangalow, NSW (full details in the poster below). Alex will also perform this piece on July 10 in Wynnum, Brisbane as part of Kupka’s Piano at the Imperial Room performance.